Out of the box, these shoes feel comfortable and powerful to the feet. The Mirage is one of the Under Armour Tactical shoes that are engineered for runners with medium, flexible arches and mild over pronation. These shoes are a bold looking trail shoe since the black rubber mesh encompasses most of the exterior, instead of just the front of the shoe. The cushioning in the sole of the footwear helps a runner feel stable, comfortable, and secure with each step, while the heat gear lining holds the foot in place to protect it from slipping out of the shoe at rugged moments. With the additional design features that reduce shock by absorbing impact, the shoe will absolutely not slow you down over the rocks, hills, and uneven terrain. If you're a more heavy duty person who's on patrol or engaged in tactical operations, you'll probably benefit from the industrial strength performance of this Under Armour Tactical shoe. The Valsetz Tactical Boot is lightweight and water-resistant with an air mesh surround, keeping your feet dry and agile. High strength nylon upper lace locks are stitched in to allow quick on or off lacing. These boots also have lower eyelets with welded TPU reinforcements for increased durability and strength. The Valsetz Tactical Boots feature a molded TPU toe guard that helps protect against bumps and abrasion in rough terrain. Fully gusseted tongue keeps out rocks debris and built in flex grooves provide aggressive traction. Available in two colors: Black or tan. The Under Armour Speed Freek Boots are similar to the Valsetz but are made with Gore-Tex to be 100% waterproof, and breathable. No matter what your terrain, if you are crossing the dessert or mountains with streams, these shoes keep your feet dry and maintain a comfortable foot temperature. 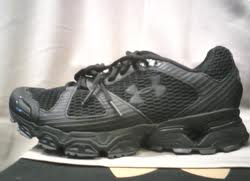 These Under Armour tactical shoes are made of pigskin leather and available in black or multicam colors. The TPU toe cap protects against the elements of tough terrain. It holds a strikingly different look than other tactical shoes, including the rest of Under Armour's line, yet is as comfortable, lightweight and durable.